She’s up when the stillness of 5:30 nudges me awake and I struggle to peel back heavy eyelids. She’s up and she sings. I wonder how she can even tell that it’s almost morning. I wonder why she sings yet. I tip-toe to the coffee pot and flick on barely enough lights as to not wake my children, and this is my quiet time and I briefly just wish that one little bird would be quiet. I lift my eyes from the worn pages of Isaiah and my gaze falls on Sarah’s notebook, left haphazardly on the table after yesterday’s writing assignment. She wrote that I was brave. That I had courage. But as I sit there in the dark, I think that I am not. I miss my friends. I know where they are, and that it is better, by far, than suffering and sickness, but I wish they were here. I miss Betty’s smile as I wiped her forehead and the way her weak hand felt in mine, her fingernails hot-pink. I miss the still, quiet hours by her bedside and the way her eyes understood even if her ears did not. I miss Katherine’s laugh, loud and audacious and when I see her children smile, I see her, and I wish the ending had been different. And I cry, because I do not feel courageous. I feel downright defeated sometimes. Maybe courage is not at all about the absence of fear but about obedience even when we are afraid. Courage is trusting when we don’t know what is next, leaning into the hard and knowing that it will be hard, but more, God will be near. Maybe bravery is just looking fear in the face and telling it that is dos not win because I have known The Lord here. I have known The Lord in the long, dark night. The little bird sings loud in the dark. And slowly, the sun peaks over the horizon. At school I ask Joyce what her definition of courage is, and she says, “to have faith.” Maybe that is just it. That we still tremble, but more than that we have faith. That even though we feel uncertain, we press into a God who is so certain, so sure, so steady. He carries us, He lifts our heads. And His unfailing love and comfort becomes our courage and our hope. It is days later and it is raining. The huge drops pelt our tin roof so hard that we can hardly hear a thing, but as the rain slows, I make out a familiar noise and I laugh. It is the same little bird that cannot contain her song too early in the morning. I wonder where she is and how she can keep singing in this storm. I wonder why she sings. But the rain slows to a trickle and the sun peaks from behind the clouds and suddenly all I can hear is her glorious song. “To have faith, “I think. And I wonder, does she sing because she knows the sun is coming? And I want to be just like that little bird. Hope is a crazy thing, a courageous thing. That little bird, she feels the sun coming, knows with certainty that it will come, even when she can’t quite see it yet. We live in a world where innocent people suffer and good friends die and stories don’t have the endings we prayed for, and the pain and the hurt, it is everywhere. But the Joy and the Hope that we find in our Savior? It is everywhere, too. I do not have all the answers; in fact, I don’t have many at all. But this is what I know: God is who He says He is. And in the hurt and the pain and the suffering, God is near, and He is good, even when the ending isn’t. And I can sing, because I know what is coming. I can hope, because I know Who is coming. In the dark of the night, I have seen His face, and I have known His promises to be true, and I know the Light is coming. And I want to be brave enough to hold out the hope of the Gospel to a world that is hurting and alone and afraid. Not a hope that is the absence of pain or heartache or suffering, not optimism disguised as hope that waits for the best-case scenario or happy ending, but a Hope that is the knowledge and full assurance that our Savior is on His way. It’s not light yet, but I know Him, the One who is the Light. And so in the dark, I will sing. This is a word that was much needed. I just returned home from Uganda on Sunday and my heart is struggling. I want to do what you are doing. My heart is still there in Kampala and the surrounding villages, loving the children and giving hope in Jesus' name. I will have hope that the sun will come out, that my God will make His Will known and mark a clear path. Thank you for looking fear in the face and choosing faith. You are changing hearts! I have only just discovered your story. I just got back from a school in Bungoma, Kenya. I thank you for your story and your blog. You give me hope that through God with faith I will be able to endure the separation from those children and teachers. I long to return. God has allowed me to see your story ...for me, today, you are my little bird. I love your heart and I will pray for you without ceasing. I am so blessed to read this Katie. Like you I am a missionary who live alone and people are telling me that I am brave enough to do what i do but they dont know that honestly, i am afraid and not courageous and that i was hoping and putting my faith and fears to God. You inspires me. Stay blessed! Thanks, Katie. I really needed to hear this right now. Life can be so dark and painful. I am thankful for our God and His light. let's keep singing. Oh Katie such beautiful comforting words in a difficult time. I pray for you and your family and I too will sing. Hugs! let us press on to acknowledge him. I'm praying for you Katie. "I thank God in all my remembrance of you, always offering prayer with joy in my every prayer for you all." These words from Philippians have become my own in regards to you and your ministry. God bless you dear, even more than He already has. Thank you for sharing this and for keeping the faith in your home. After reading your book last year, you come to mind often and today when I read your message it certainly brought my worries into perspective. Thank you for loving and living for God. Oh, Katie. That was lovely and made me cry. I woke this morning struggling with hope for this broken world and myself and your post resonated with me. Thank you. Amen. Isaiah 50:10 says, "Who among you fears the Lord? Who obeys his servant? Whoever walks in deep darkness, without light, should trust in the name of the Lord and rely on his God." Sometimes it feels like we are following the One who is the Light of the World, but we're walking in darkness...literally. I don't know what the heck is going on or how any thing will work or why God would even call me to certain places and situations. And you are right, what is asked of us is faith, hope, courage...to 'trust and rely' as Isaiah says. Hallelujah that He is coming. Trusting and relying on the only one who is trustworthy. Thank you Katie. For choosing what is real, and good, and life. I praise Jesus for the ways he is displayed through you and your beautiful family. Thank you for providing this beautiful reminder, to this woman you don't know, at a time when she needed it so desperately. Blessings to you, sweet sister. Beautiful. Faith is courage, a faith not in what we know but in who we know. We can courageously continue not because we are courageous but because He carries us when we're not. Bless you greatly my sister. So beautiful Katie. I love to "hear" your voice out of the darkness. I have missed it. You are brave and courageous and like the little bird. Praying for you here in Michigan. That kept so many warm." Katie, I have followed your blogs fairly regularly and have always found them incredibly encouraging. Life seems like it has been really rough for you lately, and I have missed your blogs. Today, randomly I decided to check your blog - and was surprised to see you'd written again! Your words brought me to tears, and I think God may have had you write this today for me. I'm a youth leader in a small community and just this past week, we had a young man die who was very near and dear to many hearts. Last night I lead our youth group through a night of remembering this young man and pointing them to Jesus through it. It was hard - I've never lost anyone that was so close to me, so this has been a huge struggle for me as well. I was struggling this morning especially, and stumbling upon your blog was a God send. It was definitely what my heart needed to hear today. Thank you for being faithful to what God has called you to do. Im doing a project on you for school and I was wondering if you would send me some information. When did you first come to know christ? How did you prepare yourself for the mission field? And what was your early life like? Welcome back Katie, and thank you for that beautiful post. It comes at a good time for me as I care for my sweet uncle who is terminally ill. He grows weaker day by day but his faith does not and I know God is near. I just love you Katie! I read your book and it has changed me. Thank you for being the light of Christ in a sometimes dark world. The Light is coming and has come! Katie, you are brave, and He walks beside you as you go. Thank you for these beautiful words. Oh Katie! I'm in nursing school now and there is so much to learn... my textbooks are thick. I have to study, but I read your book and there is a huge part of me that wants to jump on a plane and empty the ocean with an eye dropper with you somewhere in the other side of the world. However, I'm discovering as I'm in the hospitals more and more... being a nurse requires more than just head knowledge, but love and courage of the heart and soul. So much of what you write about I see and struggle with myself right here at home. Thank you so much for sharing your thoughts and feelings... your struggles... because it makes me feel less alone. Of course the Lord is always with us and a true Comfort and Companion in the moments of precious midnight hand holding of a dear friend that is sick. I've often thought that He is the only person that has shared ALL of those intimate moments with me and those I love... it makes Him all the more special. But it's also comforting to know that a beautiful sister in Christ is sharing in the struggle too. A big sister to look up to that is honest about what is really happening in her heart... being able to relate so much to the cries of my own. Thank you so much for sharing life with us, my sweet friend. I am praying for you. May God bless you and keep you. May His face SHINE UPON you and bring you peace. March on with courage, my soul. I cannot even describe to you how special and honored I feel, by God leading me to your page. Not sure why at this moment, other than to begin praying for you and your walk and to hear the blessing and miracles he is able to use you for. I wish I could put into words the emotion I am feeling after reading just a few entries. You have such a beautiful spirit, and a contagious heart for the Lord. I like you was a High School Queen...always drawn to service and living a life for the Lord...but somewhere along the way I put God on selective hearing...only listening to the things that worked best for me and my life. What a wonderful reminder that I should be following him 100% relying on him, having faith and courage in him and his plan. You are making a difference...and its a beautiful testimony. Thank you for sharing. prayers coming to you from Kentucky. Katie, Thank you so much for the raw honesty with which you write. Thank you for sharing your heart and allowing others to be motivated and inspired and challenged by your words, and by your life. I have been so encouraged and reminded and inspired by your words - both in your blog and in your book. There is so much that, as I read your experiences, I am able to fully agree and say, "Yes, I get this!" or, "Yes! She gets it!" Thank you for being real, and for always pointing back to our Savior. In my last blog post, I quoted from "Kisses from Katie" a passage that so directly applies to my life as I am "house mom" to 7 girls at a children's home in the Dominican Republic: "How do I tell a child I love her when she doesn't know love?..." Your words and heart were a blessed reminder to take off my earthly eyes and see with a heavenly perspective once again, and to simply keep loving. Beautiful, Katie. I,too, want to have that courageous faith. In some moments I fail miserably. But I still sing of His faithfulness and love. Dear Katie, Your are truly a inspiration to me! I love that you trusted God in all things and took what he put on your heart. Someday I would love to vist Uganda help with the poverty! Katy your stories inspire me on a day to day basis. I Have just come into the faith and I can already feel God working in me. trusting in Him is what I pray I can be able just to accomplish on a day to daY basis. I cannot begin to fathom the amount of faith and bravery it takes to wake up every morning and seemingly face all the troubles you have been surrounded with and yet you have smiled everyday, loved with out stopping, and had faith in the darkest of times. I am praying for you and your family. blessed is His name. You are truly one of the most amazing women I have ever heard or read about. You inspire me everyday and I truly wish your life is blessed everyday with a small glimmer of sunshine. Even when your days may seem dark and scary I hope you see the Fathers light at the end. I pray that i can become a prisoner of hope just as you are. I am trying to become a High School foreign exchange student to a south American country, I ask that you may pray for my success through that so I may be able to let God shine through me and show his love to others. I am cheering for you everyday no matter what, have strength for He is with you. I am always blessed and encouraged by what you write--even the hard, sometimes sad stuff. Your outlook and dependence on God at your age blows me away. Blessings to you and all of your family there!! thank you. just thank you. these are powerful words. Thank you. I have just been doubting but now it seems so clear. I simply must obey. Don't sell yourself short dearest for He is using you for amazing things. Amazing testimony! Thank you for sharing. "He is our light and our salvation - whom shall we fear? He is the stronghold of our life - of whom shall we be afraid?" Psalm 27 May God continue to strengthen you and fill you with His light as you continue to love your children and all that He puts in your path. Thanks Katie. I like how C. S. Lewis put it - when Jesus comes back, He will make all things sad untrue. Yes, keep singing! He is coming. He always comes. I love reading your passages. Wow ! Awesome words Katie ! I love to read your raw, honest , thoughts. You have such a way of putting your thoughts down in a most beautiful way. I can't help thinking that If you hadn't gone through those difficult times you wouldn't be able to truly understand and to reach the people that have been through that same type of pain. And so earning the right to be heard and really believed. Perhaps God is refining you so that you can be used most greatly for his kingdom, but even more so that you can have closer fellowship with him. I pray that you have joy overflowing and that you always find yourself singing , in the rain or dark or anywhere you find yourself! "Courage is trusting when we don’t know what is next, leaning into the hard and knowing that it will be hard, but more, God will be near. Maybe bravery is just looking fear in the face and telling it that is dos not win because I have known The Lord here. I have known The Lord in the long, dark night." "Courage is trusting when we don’t know what is next, leaning into the hard and knowing that it will be hard, but more, God will be near.....I have known The Lord in the long, dark night." Your honesty and vulnerability are so inspiring Katie! You live out what it looks like to be completely committed to God's plan for you and that is so moving. Know you are lifted up in prayer and continue to lean on your Refuge and Strength (Ps 46). Thoughts from the heart. His heart. Thanks. Wow. That hits so close, and it is such a blessing. Courage isn't so much about not fearing, but about just doing the next needed thing. God bless you. Keep singing His Song. It fills His heart with so much joy! He loves you and the children so much! I have been raising two boys and the Lord has been calling me do foster care/adoption here in the States, but it is fear that holds me back. But it is getting to the point where my heart is going to burst if I don't move soon. God is so good, he's brought me a a Christian friend who does foster care and she just got a very special 6 year old boy last week. I've been able to help her and love on that little boy. I have been able to see the anger and hurt he is going through...and I pray for him. I can feel the Father's Love for Him, BURNING so strong when he thinks the world has forgotten Him. I hear the Lord calling me to reach out to the broken. I admire you. Keep up the great work. The Lord sings over you. Yes. I know the One who brings light. This post just touched my heart. I can see how much you love the Lord and willing to do what ever it takes to do His will. God Bless you and may all the efforts you are putting in for the people of Uganda be blessed tremendously. Be assured of my prayers for you all and for all your work.Love from India. May our faith be courageous. Or is it faith? I miss you and love you and sing in the dark with you. Keep singing so courageously, sister. You are not alone -- Christ carries every note. This is beautiful. Thank you for sharing your heart. It's easy to hold on when we see the good that is coming. It takes faith, and courage, courage to hold on when we see no good, but we know that God is good in spite of it all. Some moms don't let their children see their struggles. A great mom pours her faith into her children, through her struggles. You are a great mom. This was just what I needed to hear today. Praise the Lord for using you to speak to me. Bless you dear sister. This is exactly what I needed to hear today. Praise the Lord for using your blog to speak to me. Bless you dear sister! You don't know us but you filled our family with inspiration yesterday when we poured through your online videos and writings. It seemed we couldn't get enough - trying our best to soak up some of your faith and, dare I add, hope. For hope is what we ran out of in our family - in our adoption of two children from Ethiopia who were wrongly separated from their siblings. We ran out of hope that the younger of the two would ever stop bullying our daughter and in his words trying to ruin our family. We are leaning close to God as we go day to day. Thank you for telling your story. We are on a similar journey and glad for your company! May we too sing in the dark! I read your book this year and regularly pray for you and your ministry. Thank you for this post. My husband and I moved to central India this year and have experienced loss and sadness working with orphans here. Your words are encouraging and the truth!! This brings me to tears...He is faithful. Thank you for opening your heart to us and for speaking so rightly about Him. Oh my goodness...this is so beautiful I'm in tears. Thank you for encouraging my heart. Wow. I don't even have words. Just wow. I'm new to your blog, was given your book this week. And I'm already blown away. Oh my goodness...this is so beautiful that I'm in tears. Thank you for encouraging my heart. Your story is amazing. I am so touched by how you are living out Romans 12:1. May God bless you and your precious family richly. Blessed by this! I am praying for you! I find courage, and my faith is encouraged, by those singing in the dark around me, like you, Katie. Thank you for being honest and a light at the same time. To Him be all the glory! Thank you for that today. It was exactly what God knew I needed to hear. What a beautiful blog today, Katie. Thank you for taking the time to write. I, too, have a distinct bird that sings outside my window. So often I have felt it was God's way of singing over me. And not surprisingly, the little thing sang just as I was reading your post. I couldn't help but smile. Know that He sings over you as well. With such joy and love! You are courageous, Katie! I often remind my young girls of what you are doing to encourage them to live for God and others . What a beautiful post, Katie. Keep going strong. These verses came to mind as I read your post -- "Now faith is the assurance of things hoped for, the conviction of things not seen. For by it the people of old received their commendation. By faith we understand that the universe was created by the word of God, so that what is seen was not made out of things that are visible." (Hebrews 11:1-3) This whole chapter has encouraged me so much lately, and I hope it will speak to you, too. Timely and encouraging my sister! Thankful Thankful Thankful!!! thank you for posting, Katie! Your words are like a song in the night for so many of us. :) Please keep posting and let us know how we can specifically pray for you! You are one of the most encouraging people I've ever known about. God has His hand on you, and your faith in Him and His goodness makes me strive to have a closer walk with Him. When I read your blog, I have hope in Jesus and am reminded of how beautiful and loving our Savior is. God bless you and your precious family! This is such a powerful message. A message to receive to know the light will shine through the dark.. Yes!! And thank you. We suffer "too small" here in the US. Therefore, our courage is a bit limited most of the time… Lord teach us to trust you with the small and the not so small and not to miss the joy that can be found in suffering with you! Katie you're such an encouragement. God has His hand on you, and your faith in Him and His goodness helps me strive to have a closer walk with Him. Reading your blog encourages me so much and reminds me of how beautiful and loving our Savior is. I will continue to pray for you and your beautiful family. God bless! Oh YHWH God, please give me words that will slice through the wind between Portland, Oregon and Uganda, Africa, that will speak life to your daughter, Katie, and grace and presence. You love her. Oh how deeply you love her. Your presence, O great God, is one of the biggest proofs that You love her. You are a God to be feared and loved, and You are sooo worthy because You step into our now and into our dust and You aren't afraid of us. You are the God-with-Katie and her beautiful children. Please strengthen her, oh King. Give her peace in the morning and strength. Give her wisdom throughout the day and grace deep into the night. Jesus, when failure seems so overwhelming and pain seems so overwhelming, give her Your comfort. Protect her from the enemy, in the Name of Jesus Christ. You are her Defender, the Healer, the Almighty God. Please hold her fast and give her Hope, a great gift. "Let us not become weary in doing good. Peacemakers who sow in peace will reap a harvest of righteousness." I am always so encouraged by what you post, and it is amazing to see Dad's work in you. I can't wait to worship Him with you, and if He permits, just sit and talk and see what He's done in you. Surely He wo began a good work in you will see it through to completion,and He is with you to help you do the works you were planned to do (Ephesians 2:8-10). Your family is in my prayers. Keep being a mom that points to Jesus. Thank you for reminding us of this blessed hope. I'm thankful God has given you the faith to be courageous! Your post was a blessing! Thank you for reminding me that God is able. You have reminded me that God is Enough. He always has been and He always will be. so beautiful. what a amazing reminder to praise Him even when things in life are hard, or we don't see his purpose for them. so inspiring! thank you!! You are an amazing person and will be blessed! I just started reading your book, and I will be donating to your ministry. I would like to maybe even visit one day. Amen. And we must not forget the Lord's promises. Amen. We must not doubt the Lord's promises. We have hope. So the same day you wrote this blog post I along with my dad and another father daughter team bought our tickets to head to Africa. I have felt called to go there since I was in middle school and now I am finally going (at 22). I just want to say thank you for showing faith by just following Jesus one step at a time where ever he stepped first (even when it looks like he could have stepped on green grass and instead took a step in the manure). After reading your book I was like I have to find a way to meet this girl cuz I want to do exactly what she is doing, but over the last 3 years since that thought I have matured a lot and through lots of scripture, sermons, people, and good ole journaling I now understand that my own journey to follow Christ will take me on a separate path, but as long as I follow him and not another life journey that I will find joy even through the difficult times. That Jesus gave me desires and dreams similar to yours, but none the less the journey will be different, the outcomes will be different. After reading your story I did fall in love with the Masese people and hope that while I am in Jinja with Good Shepard's Fold Orphanage that I will get to share in life with some of those precious people. I also appreciate stories like this that bring the realities of missions to life, it is not always about saving lives. Sometimes lives are lost when nothing about the situation suggest that it is time and in those moments we get the opportunity to find that the Son will RISE in the end, it is the only thing that allows us to press on through all the evil and sickness to show the world the only good that exist is the living Christ. I think we can all tell through your hurts that this has been a hard and yet sacred time for you and Jesus, I will continue to pray that you would know him more intimately through this and each trial you get to face with him. Katie, please write another book. Your words are incredible. And so is your heart. Awesome insight on hope and faith! They are so intertwined and they both take courage! The rewards for stepping out in faith is meeting with the Creator...what an awesome opportunity too! Remembering you and your family in prayer today! Thank you for choosing to sing, little bird. And we will hold up your wings. Thank you for choosing to sing, little bird. You have many who will hold up your wings. Katie, I have followed you from the beginning. I read your book when it first came out and I have cried and laughed with you through many valleys and mountain tops. My family has been coming to Uganda for over 5 years to minister alongside Hoima Fellowship Baptist Church and we have counted "as our own" 3 young men (since my son first started going over - he is now working and serving in the Middle East) as sons, a daughter-in-law, and I have a new grand baby I have yet to see!! God has been so gracious!! My mother passed away a few weeks ago, and I was her primary hospice nurse. My husband and I have a very strong calling to come back to Uganda again now and stay for a bit of time. We will be doing ministry all over, Hoima, Kyangwali, Kampala, Entebbe...and I wondered if we could come and help serve in some capacity? Even if only for a day. We will be nearest to Jinja from 12/31-1/18. You can reach me at lgblakesley@gmail.com anytime. I am a member at the Church at Brook Hills in Birmingham, Alabama, and very much enjoyed your visit! Please let us know if we can serve alongside you in any capacity! May God bless you and your ministry for His Glory! Maybe courage is not at all about the absence of fear but about obedience even when we are afraid. Courage is trusting when we don’t know what is next, leaning into the hard and knowing that it will be hard, but more, God will be near. Maybe bravery is just looking fear in the face and telling it that is dos not win because I have known The Lord here. I have known The Lord in the long, dark night..... This spoke to my heart deeply! Thanks for sharing. I want to lean into the hard knowing God will be near. Your book touched my heart and your life inspires me to reach out to the people right around me. I am a missionary in Wyoming, Michigan; a world away from you, but I am so connected with your story. I see the same hurt, the same brokenness, and go through the same struggles you do. But I also know the same Savior and hold on to the same hope in Jesus Christ. Our God is an amazing God who has already defeated death and already knows the plan for our lives! Thank you for your encouraging words and your honesty, you are an blessing and wonderful sister in Christ! I just finished reading your book, what an amazing story. I have three girls, all teenagers now and it amazes me how much you and your girls give each and every day. Your unconditional love and faith are an inspiration to all of us. I will say a prayer for you all every day. Thankful for you, Katie. He reaches far and wide through your obedience. Our love and prayers for you. All glory and honor and praise to Him! I'm praying for you Katie. Thank you.... Not just because of you, but because of seeing God inside of you, I decided to finally open my heart to what God wants me to do. My eyes and heart made their home in a small, poor, and dangerous area of the dominican republic last year. When I came home, a burning arose in my heart and it wasn't until I finished your book that I realized I could no longer ignore where God was calling me to share his name. It is my Ninevah and I was avoiding it for such a long time. Until now :) Because of your love as a parent, I am spreading my heart out to the boys that live in the DR. I wish to become a foster parent in that country and do it all for the glory of God. Because of Christ showing himself through you, life will no longer be about me, but about making HIM known! Thank you! Katie, you have inspired so many people to serve God more and to do his will, even if it is not the plan one had for their own life. You have been apart of inspiring me to seek God more and to seek his will for my life and the life of my 3 children. Thank you for showing the true love of God and for being who you are. My prayers are with you and your children. 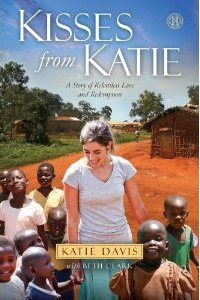 God bless you, Katie Davis and all you do for the people of Uganda which in return trickles to people all over the globe. Courage isn't absence of fear. Courage is acknowledging that you're afraid and uncertain and doing what needs to be done anyway. Faith is an important part of that, even if it's just faith in yourself. Thank you so much. I cling on to every word you say. You inspire me and your faith in the Lord amazes me. I love what Joyce said about courage. I have never thought of it like that before. God bless you! Loss is hard. Praying for you. Thank you for following God's lead in your life. About a year ago - your Spirit inspired book fell into my hands from a good friend of mine. My life was forever changed- I am daily inspired and motivated by your courage and recklessness to be fools for Christ as St. Paul demands of us. Three months ago I arrived on the soil of Zambia for a one year commitment. Shortly after arriving - God made it evident He is calling me to also make a lifetime commitment. I would love to be able to talk sometime and I am asking for prayers for my family - they really struggle with where God leads me...Be assured of God's love for you - He is surely looking down upon His beautiful daughter Katie and saying, "Well done my good and faithful servant." You have an amazing heart and I praise God for your pure heart to serve Him. If there were more people like you - the world would be a much more loving place. I am sharing link to a blog I am keeping while here. Be assured of my prayers - dear sister. It's 9:52pm on the East Coast in the states, and it's 5:52am where you are. Perhaps the bird is singing already. :) I enjoyed your post and am thinking of you and praying for you as you begin your day. It is 9:54pm on the East Coast, so it's 5:54am where you are. Maybe the bird is already singing? :) I just wanted to let you know that I enjoyed reading your post, and am also thinking of you and praying for you this evening for me/morning for you. Cling to hope; keep singing, friend. I really like what you said about courage simply continuing to follow Jesus when you are afraid. I needed that today. Hello katie, i have been really blessed by your bog. I just want you to know that nothing God does will make sense to us. If everything God did made sense, He would not be God. "Trust the Lord with all thy heart and do not lean on your own understand." Take care. Amen.... I love you Katie! We all love you so much! Well said. I am encouraged by your thoughts. Katie, thank you for faithfully obeying our LORD. I started following your blog a year ago when my 3-yr-old son was diagnosed with leukemia. Jesus has used you and your beautiful family to comfort me, put things in perspective, and draw me closer to Himself. There are no words to thank Him enough for that. This year my Emmanuel's cancer has relapsed. After 9 months in the hospital we are tired and we sometimes wonder about the darkness and the prayers not being answered how we would choose. Thanks for reminding me today of the truth. The King is coming! I can hear the song too. Thank you sister. "How beautiful are the feet of those who bring good news..."
I am amazed and inspired at how selfless and caring you are. The world is a much better place because people like you are doing something to help those in need. God bless and keep up the great work you are doing. I, too, have a Hope, and I prayed for a happy ending for my mom that didn't come. Thanks for your encouraging words. They really helped! Keep going sis. He is with you. Be strong in the Lord and in the strength of His might. Thank you for listening to Dad's voice. May He give you even more of the Spirit, and may this part of your life be even more blessed and full than the first. It'll be awesome to worship the Lord with you and all those who have been lead to our Lord through you. I was so moved by your blog that I sent it to several of our friends and Missions Committee members at our church. God bless you and we're praying for you and your children. Thank you for the beautiful way you share your heart and your struggles! This is what I needed today... That courage isn't the absence of fear, but trust in God in-spite of it! To lean in harder, knowing it will be hard. Thank you again, God's given you such a gift and I'm grateful you share it!! Katie, know your heart has ached and so longed for different outcomes. I came across this today and decided to share in the hope it could help. "here are words you don't use in medicine , such as "cure." But a remarkable case study in an HIV positive patient treated with black seed extract resulted in a sustained remission, indicating a safe, accessible and affordable alternative to highly toxic antiretroviral HIV drugs may already exist. Nigella Sativa, also known as 'black seed,' has been studied for a wide rage of health benefits, but not until recently was it discovered to hold promise as a curative agent against potentially lethal viral infections, including Hepatitis C[i] and now HIV. Despite its commonplace use as the standard of care for HIV treatment globally, anti-retroviral therapy remains highly controversial, in part because the adverse health effects of the drug class may outstrip those associated with the HIV infection itself. This is especially true in cases where the infection was treated 'early,' having been discovered through routine blood work in asymptomatic and otherwise still healthy patients. Drug therapy can also produce selective pressure on the HIV virus to mutate and gain resistance, with the net effect that a stronger, more drug-resistant form of HIV is produced in the body at the same time that the drugs have done severe and even irreversible damage to the patient's immune system. Sadly, however, the decline and ultimate death of the patient is rarely if ever attributed to the treatment (and its many iatrogenic effects) but rather to the "disease" itself – a well-known problem in our failed 'war against cancer' where the victim (patient) and the 'the cancer' gets blamed for the incessant failure and even disease-promoting properties of chemotherapy, radiation and surgery. This is all the more reason why the possibility that an ancient healing food like black seed -- which the research shows is generally safe, affordable and accessible -- can cure HIV is so exciting. Your posts are such a blessing. Thank you! Stay in the shadow of the cross. The Lord be your rest. God's heart through your extra ordinary life. Really this is a Great blog, very informative and useful for me. Your blog is so encouraging! May God bless you each day in some special way! This is exactly what I needed to hear. Thank you Katie! I am 14 years old and I just finished your book. I both cried and laughed as I read about your experiences. My prayer is that God would make me fearless like you and help me get out of my comfort zone to serve people the way you do. Thank you for being my role model and changing my heart! i can't really believe that i am with my Ex-Husband back after when he broke up with me with 4 kids i thank Dr Atakpo of (dratakpospelltemple@gmail.com) for helping me getting back my man back, My Name is Mrs Rhona Cole i am from England and my man name is Mr Alan Cole, my happiness turn to bitterness,my joy turn to sorrow,my love turn to hate when my husband broke up with me last week,i was so frustrated and i could not know what next to do again, i was so unthinkable and i could not concentrate any more, i love my husband so much but he was cheating on me with another woman and this makes him broke up with me so that he can be able to get marry to the other lady and this lady i think cast a spell on my husband to make him hate me and my kids and this was so critical and uncalled-for,I cry all day and night for God to send me a helped to get back my man until i went to Westmoreland to see a friend and who was having he same problem with me but she latter got her Husband back and i asked her how she was able to get her husband back and she told me that their was a powerful spell caster in Africa name DR ATAKPO that he help with love spell in getting back lost lover's back and i decided to contacted the same Dr Atakpo and he told me what is needed to be done for me to have my man back and i did it although i doubted it but i did it and the Dr told me that i will get the result after 24hours, and he told me that my husband was going to call me by 9pm in my time and i still doubted his word, to my surprise my husband really called me and told me that he miss me so much Oh My God i was so happy, and today i am happily with my man again and we are joyfully living together as one good family and i thank the powerful spell caster Dr Atakpo of dratakpospelltemple@gmail.com, he is so powerful and i decided to share my story on the internet that good spell casters still exist and Dr Atakpo is one of the good spell caster who i will always pray to live long to help his children in the time of trouble, if you are there and your lover is turning you down, or you have your husband moved to another woman, do not cry anymore contact the powerful spell caster Dr Atakpo on his email: dratakpospelltemple@gmail.com and he will answer you, i am a living testimony and i will continue to testify of his goodness in my family,he turn my family to paradise and today we are all happy together Dr Atakpo i say thank you in one million times thanks Dr.